Today, March 20 is officially the first day of Spring 2010. Here in suburban Philadelphia it is 74 degrees. Almost summer-like. I want to be outside, cleaning up the yard and getting the beds ready for flowers. It is still too early here, we are in Zone 6 to plant, usually around Mother’s Day weekend we are safe from frost. I drove to Lowes to check out the Garden Shop with the top down and the radio turned up loud enjoying not having to wear a coat and feeling the warm sun on my face. 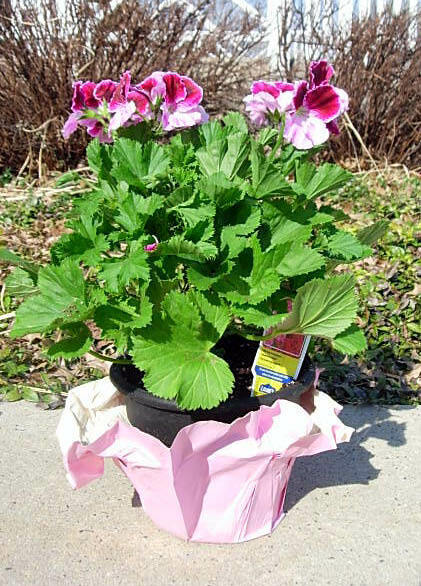 Lowes didn’t have much yet, but they did have some geraniums in plastic pots. I had to get one to brighten up the kitchen, hopefully Trax, the cat doesn’t think it is for him to play with. *If it is still too cold for any plants where you live and you want to see bright flowers in your home, see how I made fake flowers look real in this post. 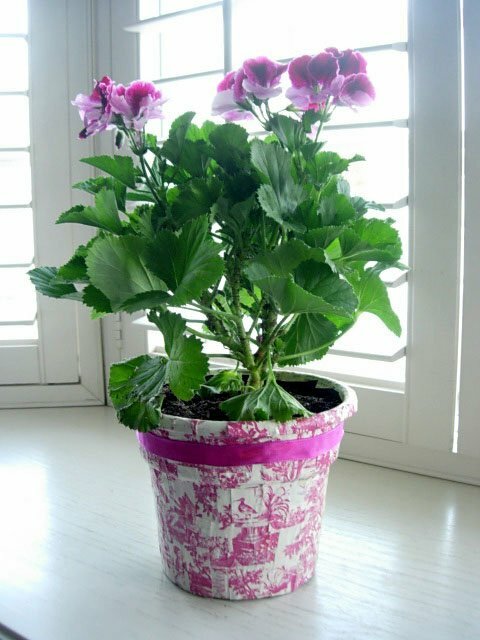 These pots of flowers are meant to be planted right away, so the pots are, ugly, not pretty. 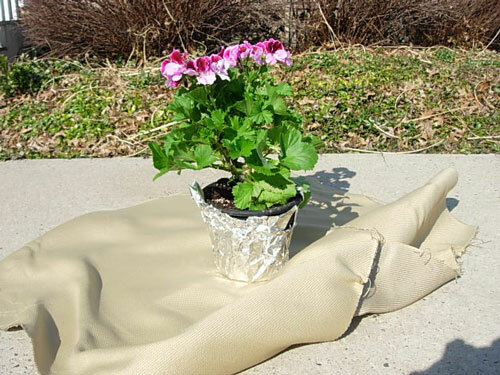 The foil paper that covers the pot is not much better. Since I plan on keeping this by a sunny window in my kitchen until it can be planted outside I want to make the pot look better without buying something new to put it in. 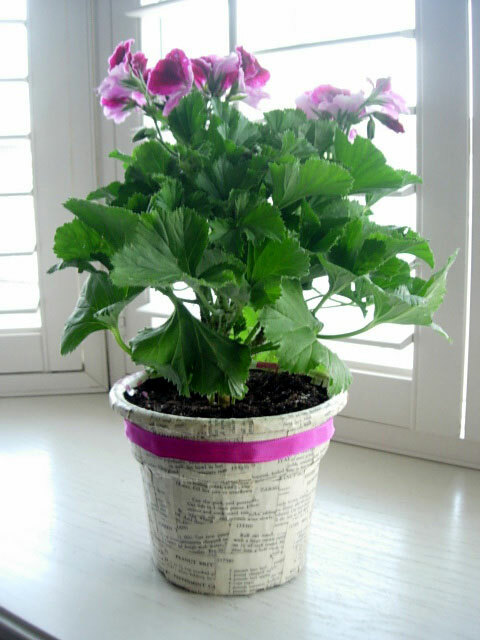 I have two variations of easy ways decorate a flower pot using what you have on hand. The first way is with scraps of paper and the second a scrap of fabric. 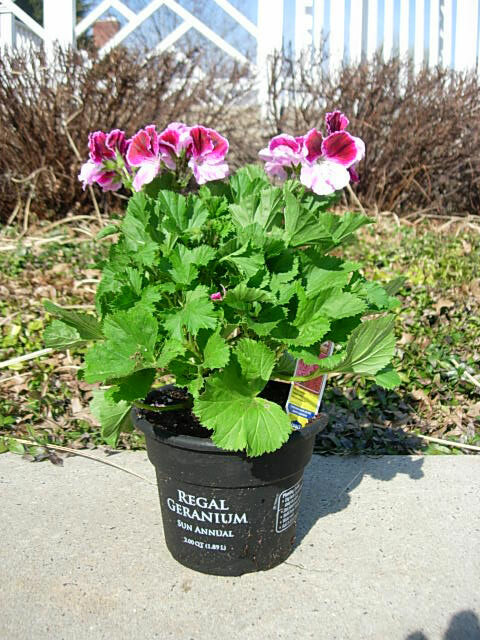 Here is the pot of geraniums I bought at Lowe’s this afternoon. Paper/foil not very attractive, yet I can’t plant this for another month. 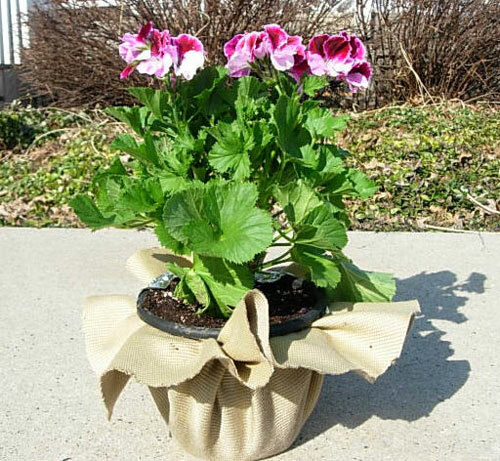 Pot without the paper cover. You will need an old book or some decorative gift-wrap. 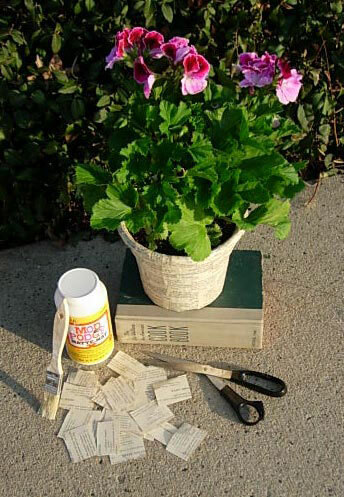 I used an old cookbook and cut the pages into small squares, then applied them to the pot with Mod Podge until it was covered. I left the bottom uncovered so I could still water the plant and to let the water drain from the bottom. A pretty ribbon and the pot now looks pretty sitting by my window. When picking out the paper to use for the pot, I couldn’t decide as I liked them both so I decided to use both. When I get bored of the old book look, I can simply turn the pot around and it takes on a new colorful personality. 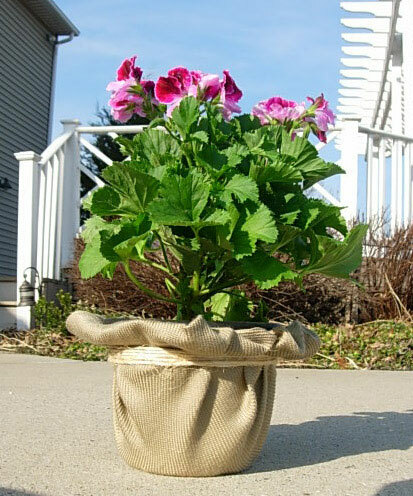 The second way to cover the pot is for when you are giving a potted plant or flower as a gift or a house warming present for a friend. It can’t be watered, but makes a nice presentation. 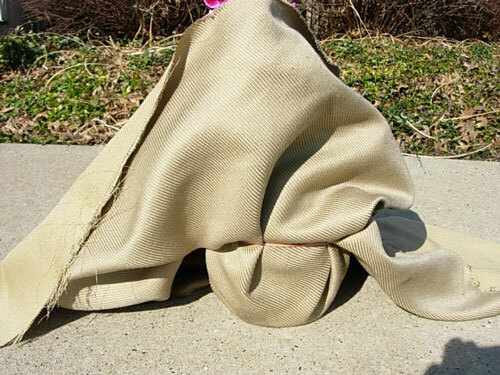 Lay the pot on a scrap piece of fabric. I wrapped the pot in foil to keep the fabric clean while I was working on the pot. Using a rubber band, one that will be snug when placed around the pot. Gather the fabric around the pot and bring the rubber band up over the fabric. Trim the excess fabric. A good way to gauge where to cut is to cut at the height of the flowers. Fold the excess over and push under the rubber band in the inside of the fabric to make a rolled top. 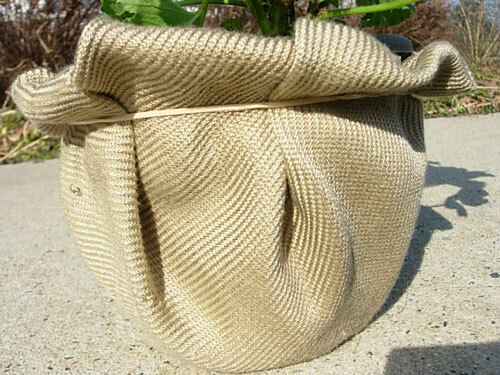 Wrap some twine around pot to hide rubber band. I have done this with a poinsettia and it has worked beautifully. Great great ideas! Dont hit me, but I also like the junky looking black one too. 74 degrees is not the norm here this time of year, but I am going to enjoy it while I can. Tomorrow it will go back into the high 50’s – 60’s and rain. Ann and Yvonne- I hope all the snow goes away and warmer weather comes your way soon. Oh, I just had to read about Spring. Cute idea with the pots! We are officially into spring and there is so much snow on the ground in Dallas that church was cancelled this morning. This is our 6th (? i’ve lost count) snow storm this fall/winter season. My daffodils and tulips are thoroughly confused. What a a great way to cover those ugly pots!! 74 degrees!WE have snow and I am not sure it ever got past 34- Oh please hurry spring!